1842 he applied for a charter for the "Cypress Causeway" which we believe to have been a crossing of Wassamassaw Swamp near where the present-day Hwy 178/78 crosses Cypress Swamp. Old Gaillard Road intersects near here and runs north. More on Gaillard Road below. HOWARD'S DETACHMENT, SOUTH CAROLINA MILITIA. us by John Inabnet the administrator of said Estate. Thomas May Zachariah Lynes William Cumings "
from Journal of the House of Representatives of the State of South Carolina, dated Dec 9, 1842. Anyone know who he is, parents, spouses, children? Where born? Where buried? 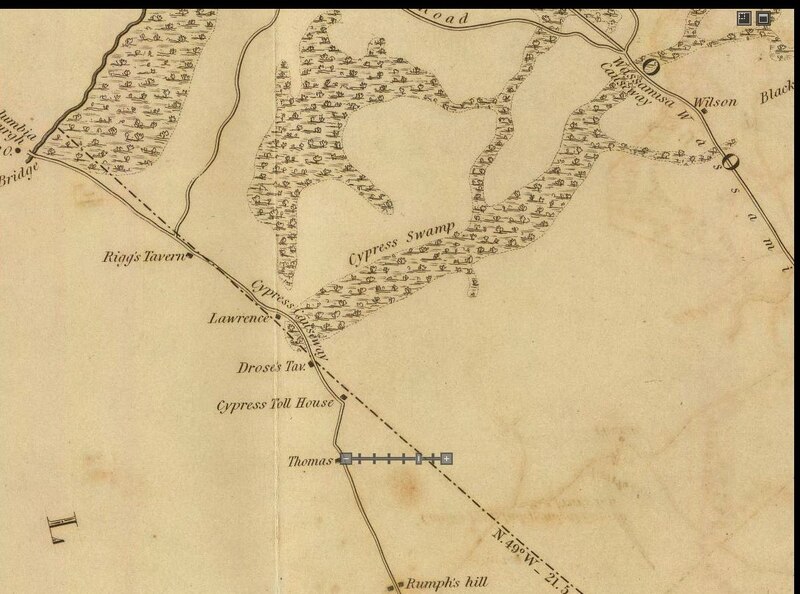 Below we see the Cypress Causeway shown on Mills Atlas of South Carolina, 1825. The road below, seen in front of Rigg's Tavern, going southeast past Lawrence, Drose's Tavern, Cypress Toll House, and Thomas is what is known as present-day Hwy 178/78, with "Old Gaillard Road" or SC State Hwy 27 branching to the right just above "Rigg's Tavern." The road further to the upper right of the map is present-day Hwy 176, that goes from Holly Hill to Goose Creek (at least). We know that Edward Lynes was made a road commissioner of Gaillard Road in 1792 which means he owned land along it, following the convention at that time of making the adjacent land owners responsible for the upkeep of roads that adjoined their lands. 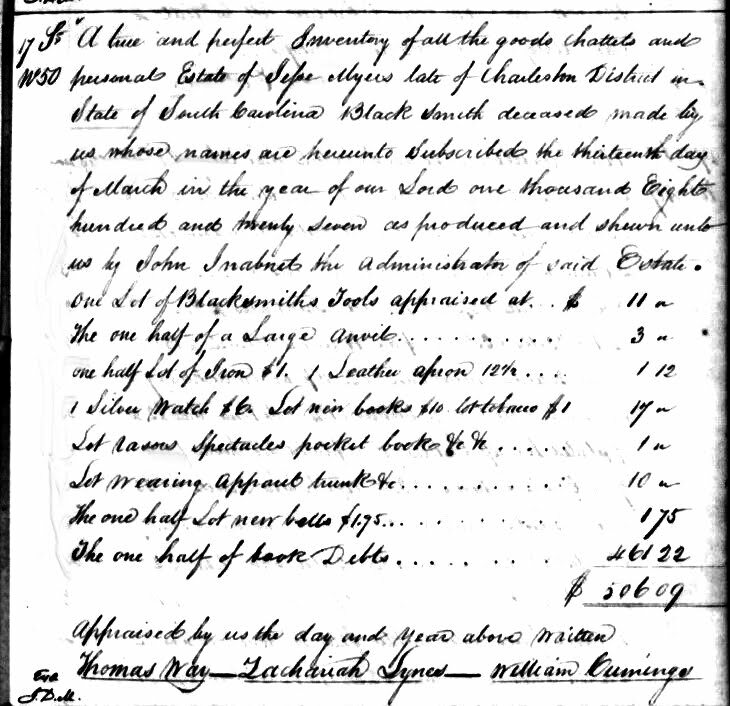 from Acts of the General Assembly of the state of South Carolina; from February 1791 to December 1794. 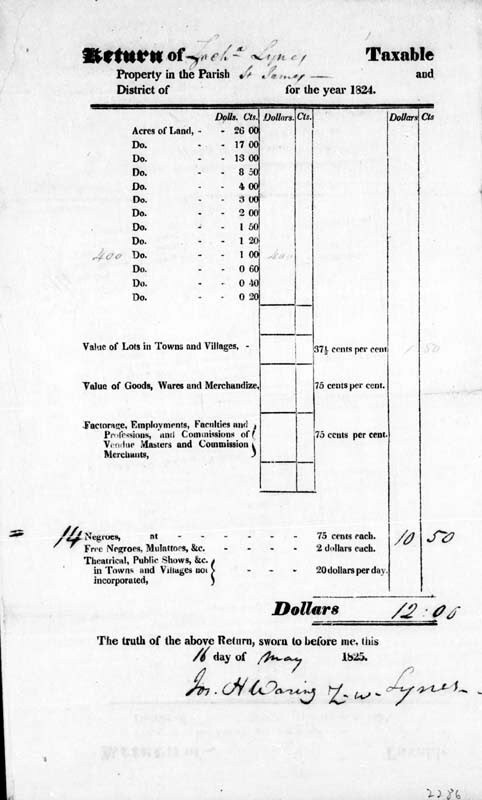 This entry is dated 1792. We also see that John Joiner is one of the adjacent land owners as well. Samuel Lynes 1720 was married to Frances Joiner/Joyner. The connection has not yet been determined. It is further interesting that this road extends south to the Bacon's Bridge area, where John Lynes 1740 had a plantation and business. In his will he left all his estate to the daughter of Edward Lynes, his brother. John was married to Peggy (Margaret) Minus, whose father, Jacob Minus had a nearby plantation. She died a young woman; John never remarried, and directed in his will that he be buried next to his wife on the plantation of her father. All that is in the neck of the woods just barely off the bottom of the map seen above. Elisha Mellard seen above is likely the one buried here: Elisha Mellard This church, Springhill United Methodist Church Cemetery, is located on Old Gaillard Road.